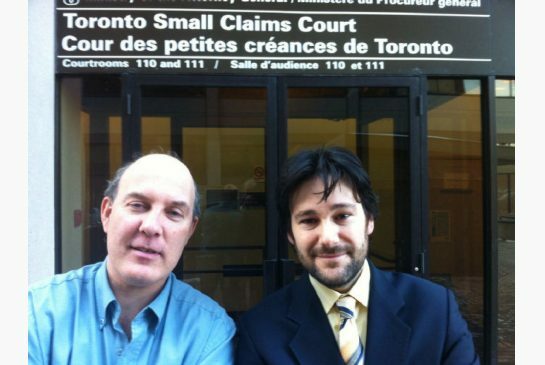 Eric Brazau, left, and lawyer Davin Charney, are shown outside Small Claims Court. On Friday, Brazau was awarded $1,000 in damages after he was wrongfully arrested and detained by police while protesting during Sgt. Ryan Russell's funeral in 2011. A man protesting the funeral procession of Sgt. Ryan Russell was “improperly arrested and detained” by Toronto Police, a judge ruled Friday in small claims court. Brazau testified that an unknown man pushed him to the ground and fled, but that police officers did not pursue his attacker, Deputy Judge Lewis Richardson said. The “police ought to have at least investigated (Brazau’s) allegations and given him a chance,” said Richardson. Instead, Brazau — the “victim” — was arrested for causing a disturbance and breaching the peace. However, Richardson noted in his decision that the reasons for the arrest were unclear given the “inconsistencies” in the evidence of the arresting officer. He found the police were more concerned with stopping Brazau from protesting than about criminal activity because Brazau was only charged when he refused to leave. The judge was further “troubled” by the evidence of the detective who kept Brazau in an interview room at 51 Division for three hours. Brazau was released without charges after the funeral was over. The officer took no notes of his interview with Brazau and did not get information from the arresting officers, said Richardson. “The police may not have been objective that day, it was certainly an emotional day,” he said. Richardson awarded Brazau only $1,000 in damages, despite him seeking $25,000, the maximum allowed in civil claims court. He found that Brazau was treated courteously by the police and that he suffered no damage to reputation, no loss of income and had no legal fees to pay to be released. “At most, he was inconvenienced and denied his right to protest,” said Richardson. There are privileges in a civilized society, and one of them is being able to mourn and grieve without harassment or disrespect, Richardson said in commenting on Brazau’s conduct. Still, it was not a reason “for the police to abandon their sworn duty,” he said. “This is a joke,” a visibly angry Brazau said when the judge made his decision on costs. Outside court, he told the Star he plans to appeal the amount of damages awarded, noting that he is out $2,000 despite winning the lawsuit. He said the judge should not have made a “value judgment” about his protest in a public space. Brazau’s complaint to the Office of the Independent Police Review Director was dismissed as “unsubstantiated” prompting him to bring the lawsuit. The Toronto Police Services Board tried unsuccessfully to have the motion dismissed before it went to trial. Another example of how Police have protectionc from Judges to engage in crime. rather than prosecute the worst criminals who are amongst "the Authorities of Ontario". Ontario, Canada's most Corrupt Province.